CAMPANULACEAE. 'ROCKBELL'. Many ornamental annual and perennial Eastern Hemisphere herbs with blue to purple bell-shaped flowers. Grow like Campanula. Good in the rock garden, border and for edging. "Good men refuse to govern..."—Plato. PALMAE. 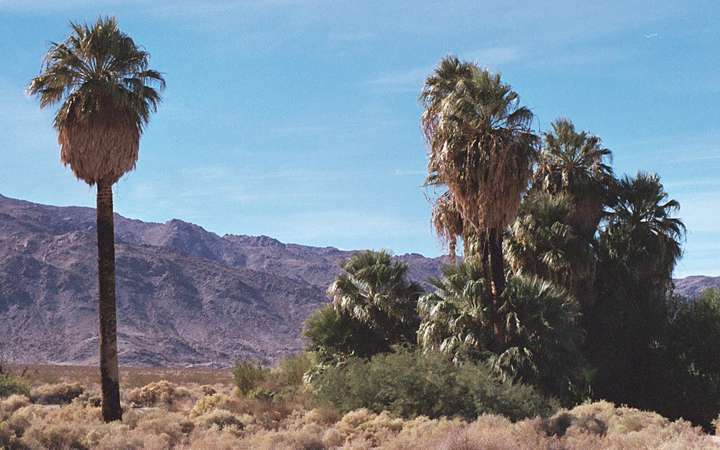 Two species of palms from the arid SW.
'CALIFORNIA FAN PALM'. 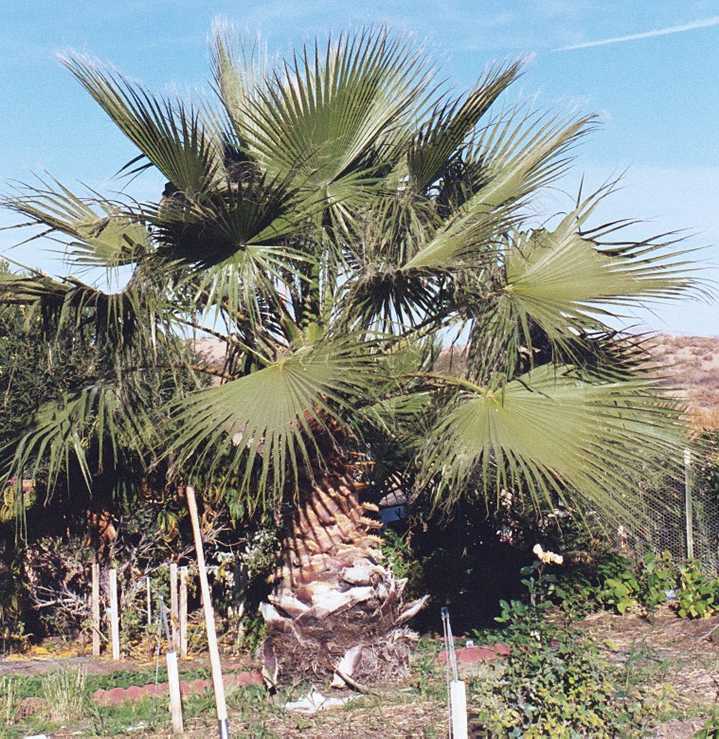 Stout-trunked fan palm to 20 - 70 feet, with 3 - 6 foot-wide leaves. Flower-stalks to 8 - 10 feet long. Small black fruit. Canyons and washes of California deserts. Zone 9. The thin, sweetish pulp of the fruits was eaten by the Indians. Seed was ground for a coconut-like meal. Sow 1/4" deep in sandy soil to germinate in 4 - 15 weeks. LEGUMINOSAE. 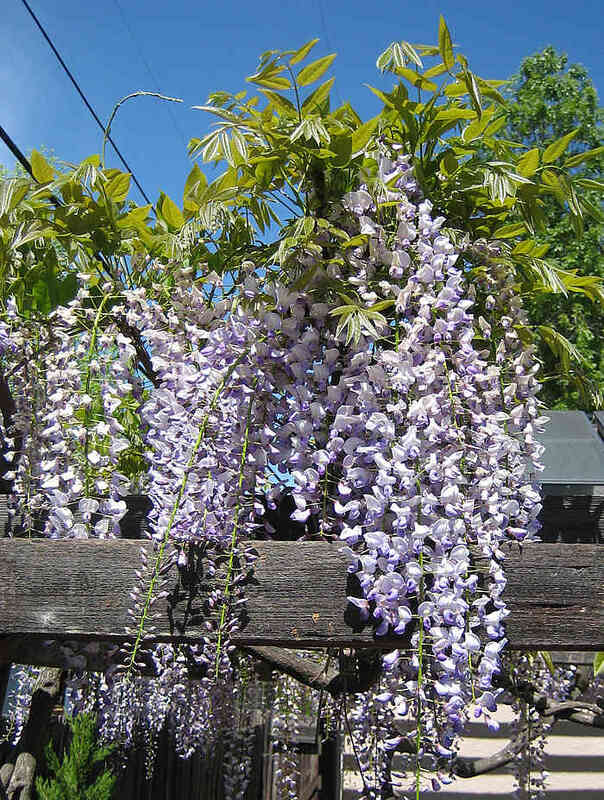 Large woody east Asian and North American vines with showy pendant racemes of flowers. Long-lived and often reaching great size, the huge trunk needing firm support. They can also be trained into graceful weeping trees. Spectacular in spring. Prefers deep rich soil. Easy from seed. Germinates in 2 - 6 weeks. Takes some years to come to flower. 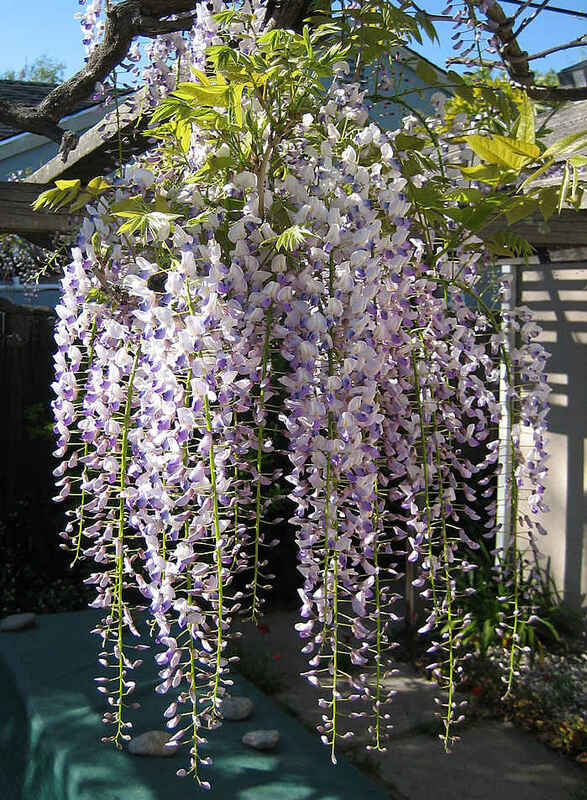 'JAPANESE WISTERIA'. Lavender-blue and white fragrant flowers in dense clusters to 12 - 18" long, appearing in April and May. Large pinnate leaves turn golden in fall. Hardy woody twiner to 40 feet. Japan. Zone 5. Stunning in bloom. Germinates in 1 - 3 weeks or so. SOLANACEAE. Ornamental woolly or hoary shrubs with clustered flowers and Chinese-lantern-like fruits. Named in honor of H. Witham, a British paleobotanist. Germinates best with GA-3. 'ASHVAGANDA', 'CLUSTERED WINTERCHERRY'. Small whitish to yellow flowers followed by attractive scarlet berries enclosed in an inflated, lantern-like calyx. Bushy shrub to 1 - 7 feet, with downy leaves. India to South Africa and Australia. Zone 8. The fruiting branches are attractive in dried arrangements. The seeds are used as vegetable rennet to coagulate milk, and the berries are used as soap. A valuable medicinal plant, the leaves and roots have marked antibiotic, anti-viral and insecticidal properties. Extensively used in India as a tonic, aphrodisiac, hypnotic, diuretic, memory improver, against rheumatism, fevers, sores, senile debility, asthma, etc. Germinates in 2 - 8 weeks. GA-3 helps. COMPOSITAE. Low hardy perennials of the W. U.S., grown for their showy, sunflower-like blooms and bold foliage. Slow growing & long-lived plants valued in wild gardens. Seed of many sprout readily, but some need 3 - 4 months cold. 'NORTHERN MULE'S EARS'. Large yellow 3 - 4" wide flowers held above the large, glossy green varnished leaves up to 1 1/2 feet long, resembling mule's ears in shape. N. Great Basin. Zone 5. Handsome perennial. The Indians ate the root after heating and fermenting, and the seeds and tender shoots were eaten. Germinates in 2 -12 weeks, and is improved by a prechill. SAPINDACEAE. A single Chinese ornamental shrub. 'CHINESE FLOWERING CHESTNUT'. Large white 1" flowers with a red or yellow blotch at the base. To 15 feet, with dark green leaflets. China. Zone 4. Hardy in the North. The flowers, leaves, and fruit are said to have been used as food. For best germination, soak 1 week in water in the refrigerator, then hold at cold temperatures until roots show in 2 - 12 weeks. Or just give 4 - 8 weeks prechill. "It does me no injury for my neighbor to say there are 20 gods or no God. It neither picks my pocket nor breaks my leg. "—Thomas Jefferson. AGAVACEAE. North American perennials and trees, with narrow, sword-shaped leaves, and large clusters of large, night-scented, bell-shaped flowers. Best in dry, well-drained soil. Good specimen plants. Seed usually germinates in 1 - 4 weeks, but stragglers will come up each year for 2 - 3 years. Seed long-lived; a 6 year old lot gave 95% germination. Some types have hard-shelled seed, and will benefit from a light scarification. 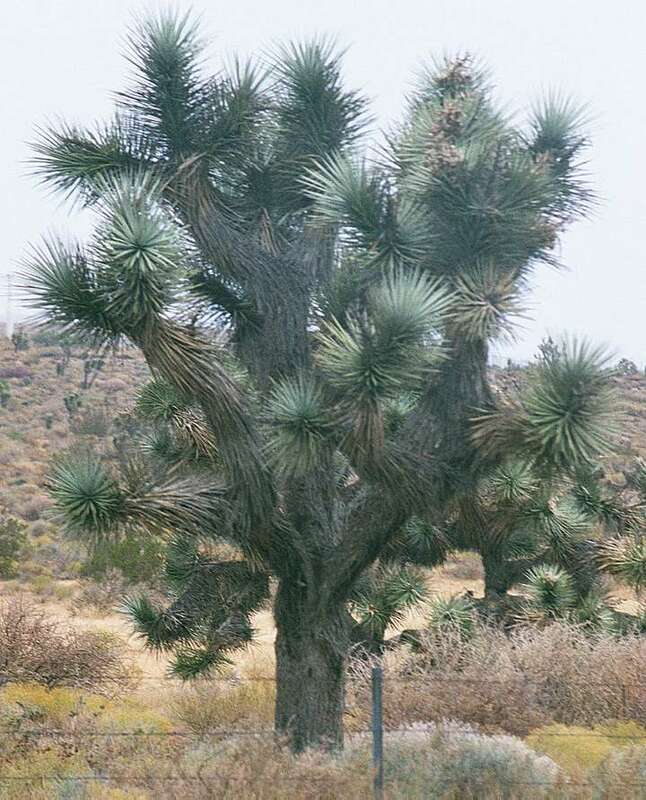 'JOSHUA-TREE'. Striking peculiar tree to 16 - 30 feet, with bent arm-like branches ending in rosettes of narrow 9" leaves. Greenish-white 2" flowers with thick fleshy petals, crowded in heavy, foot-long panicles followed by spongy 2 - 4" fruits. Mojave desert, California. Zone 6. May live we 1000 years or more. Soak seed 24 hours. Can germinate in 3 days at 80 - 90°F; usually in 1 - 2 weeks in the open. Some will hold over and come up each year for 3 years or so. The flower buds were roasted on coals and eaten, and the seeds ground and eaten raw or in mush. 'SOAPTREE YUCCA', 'PALMILLA'. Tall 6 foot spikes of creamy white 2" bells, often tinged pink or green. Round heads of stiff, narrow 3 - 4 foot leaves. Forms a trunk to 20 feet with age. Southwest. The flowers are eaten raw or cooked, and the young fruits are said to be eaten. Roots used as soap. 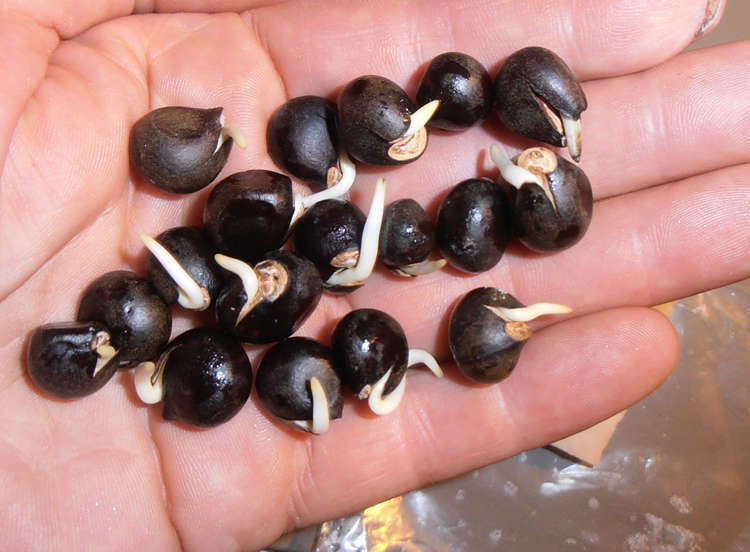 Germinates in 2 - 4 weeks, and the seedlings grow rapidly, forming nice plants. "The more corrupt the republic, the more numerous the laws. "—Tacitus, Roman historian, 110 CE. ONAGRACEAE. Western perennials grown for their showy scarlet flowers. Spectacular and tough. 'CALIFORNIA FUCHSIA', 'HUMMINGBIRD'S TRUMPET'. 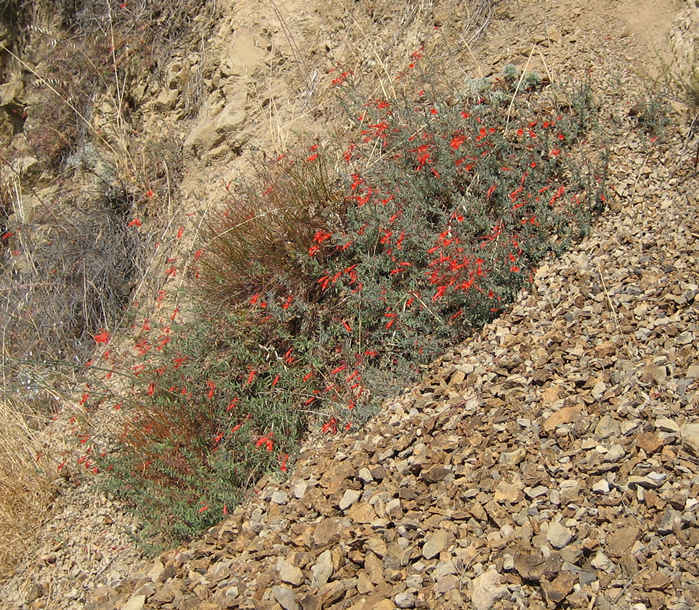 Brilliant scarlet tubular 1 1/2" flowers attract hummingbirds, late summer to autumn. Grey narrow foliage. Sprawling perennial to 1 - 2 feet. Dry, rocky slopes, California. "It is remarkably resistant to drought."—Miller. Germinates in 1 - 2 weeks. LILIACEAE. Attractive bulbous or rhizomatous perennials grown for their clustered starry flowers. Easily grown in the wild garden or in pots. 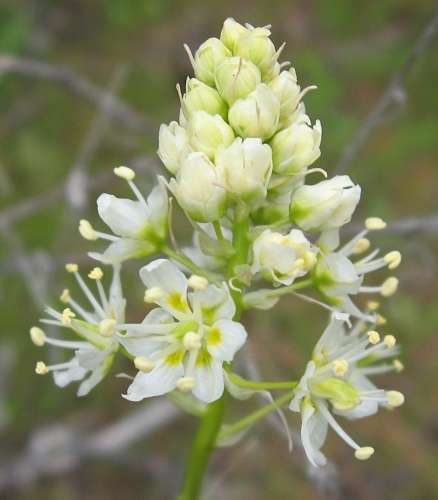 'DEATH CAMAS'. Long spikes of starry white flowers in summer. Hardy bulb to 2 - 3 feet, with narrow grassy leaves. Western North America. Zone 4. Bulbs poisonous. Prechill 3 months or sow in fall. COMPOSITAE. About 20 species of the Americas. Popular, easily grown flowers thriving in any good soil and full sun. Excellent for cutting and a brilliant display in the border. Best sown direct and not transplanted. Pinch to keep bushy. Good in pots. Thrives in hot dry places. Germinates in about 1 - 3 weeks at warm temperatures. Large 2 - 3" flowers with quilled petals, in shades of red, rose, pink, orange, yellow, and white. Hardy annual to 3 feet, with abundant bloom. Beautiful mix of crimson, orange, yellow, white and pink 4 1/2" flowers on 2 - 3 foot tall plants. Half hardy annual. Classic large zinnias for cutting. Germinates in 1 - 2 weeks. Large 4 - 5" double flowers in shades of red, yellow, orange, purple, and pink. Hardy annual to 2 - 3 feet, with strong stems, good for cutting. Bright red, pink, orange, and white 1 1/2" round double pompon flowers, summer to frost. To 1 1/2 feet. Large orange fully double blooms. Half hardy annual to 40". 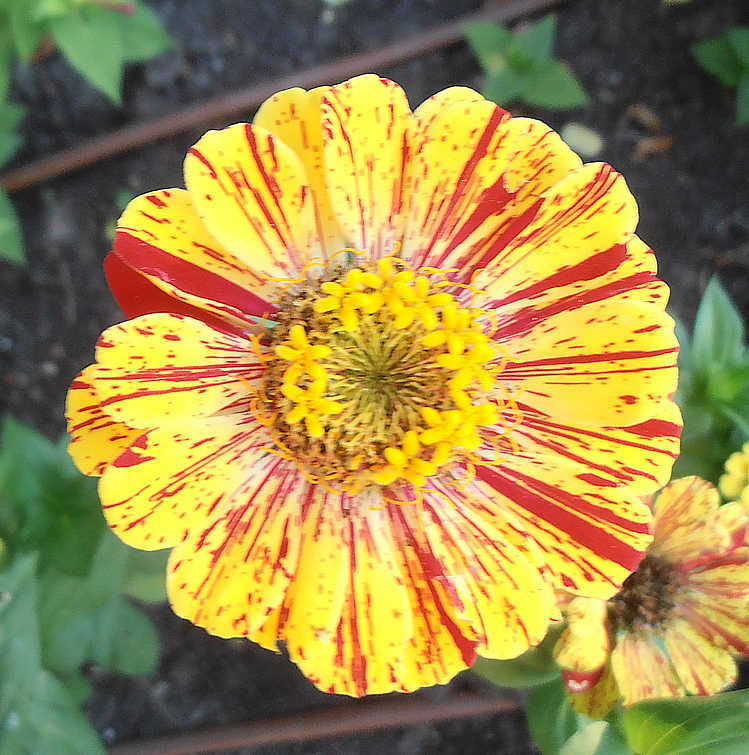 Dramatic large 3 - 5" double flowers in a wide range of colors, all striped and spotted with dark red. White, orange, yellow, pink, and creamy base color. Hardy annual to 3 feet. Introduced in 1954. Germinates in 1 - 2 weeks. Large bright rosy purple double dahlia-type flowers. Half hardy annual. Beautiful old-fashioned type of this favorite garden flower, with 2" double bicolor and variegated blooms in maroon, gold, red, chocolate, cream, pink and purple. Gives a brilliant, continuous display even under heat and adverse conditions. Half hardy annual to 16". Good in containers, for borders, edging. "They that can give up, essential liberty to obtain a little temporary safety deserve neither liberty nor safety. "—Benjamin Franklin. RHAMNACEAE. Warm-region deciduous or evergreen trees and shrubs grown for the edible fruits. Seed germinates best if soaked 2 days or given cold. Either 3 months warm, then 3 months cold, or just 3 months cold has worked. Or, the stones can be cracked open and the seeds removed and germinated. Tropical kinds sometimes germinate readily. 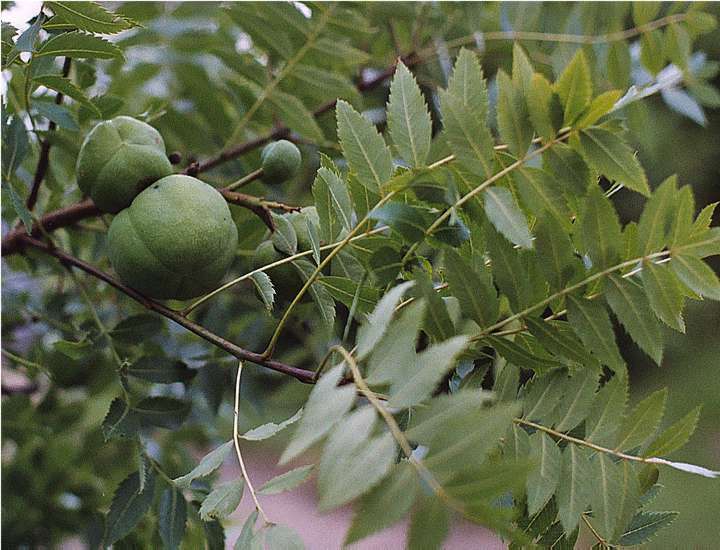 'SUAN ZAO', 'SPINY JUJUBE'. Small tart 1/2" red-brown edible fruits abundantly produced on a spiny shrub to 3 - 12 feet. with 1 1/2" leaves. Asia. Extremely hardy and drought resistant, suckers freely. Important in Chinese medicine, the seeds are sedative, analgesic and lower blood pressure. "The secret of Happiness is Freedom, and the secret of Freedom is Courage. "—Thucydides, 400 BCE.